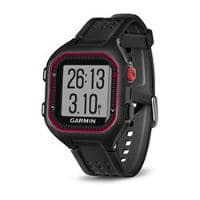 The Garmin Forerunner™ series is Garmin's product line for runners and triathletes and is the standard that other running watch brands try to live up to. GPS enabled running watches are generally more accurate and collect better metrics than phone apps which is why I recommend them to runners. This page is constantly being updated to include new models, as well as information about past models in case you come across a bargain deal on a previous model. One of the most common questions we get as running coaches is "Which running watch should I buy?". Most often our answer is, "it depends". It depends on what features you would like to have, how you plan to use the watch, and your budget. Generally speaking, the average runner does not need a high priced, higher end watch unless you really dig technology and love capturing and analyzing data. Most entry level and moderate level watches will do everything the average runner will need. The best way to use this comparison guide is to figure our your budget and then look for a watch in that specific range that has the features you wish to have. Important: When we do 'feature comparisons', we do comparison of running watch features based on the information provided by the manufacturer, in this case Garmin. Feature comparisons are generally in a chart format. When we do a 'review' of a particular watch, we do it through personal use by myself or one our coaches. Unlike other sites, we never hire writers to go out and harvest information from third party sites and write reviews based on never having used the watch. Many sites dedicated to reviewing running watches, running shoes, other gear etc. have a primary focus of making money using reviews and in some cases they even get paid by manufacturers to review their products whether it is paid directly or via free products. If we review a running watch it is because we paid for and purchased it our of our own pocket and are sharing our experience with it. If you do not see a review on a certain watch, it is because we have not purchased it. In that case, look at the feature comparison only and maybe check out third party customer reviews such as those found on Amazon. Affiliate disclosure: The RunBuzz website is about sharing information to make people better runners, and is not geared towards product reviews and making money from them. Having said that, we do put in a link in our reviews and charts that should you choose to purchase a running watch on Amazon, we do get a 'tiny' portion of Amazon's profit and this is at no extra cost to you. Purchasing through these links does help a little when it comes to supporting some of the costs of running this website, but we surely do not 'profit' from these reviews as it is not the primary purpose of this website. You are never, ever, ever, ever.... required, or obligated to purchase any running watch on Amazon through our links, however we do encourage you to check out their site as their prices and customer service is excellent. Finally, if you want to make best use of your investment, consider joining PaceBuilders, our premium training program that gives you access to unlimited training plans, guidance videos, runner-specific strength training exercise and routines, LIVE coaching Q&A calls and a private community of your peers, then get started right now, and join PaceBuilders today. There are two models currently in the Garmin product line that fit within the entry level running watch category. Each watch will track pace, distance, and laps/intervals. The biggest difference between these two running watches in that the Garmin Forerunner 35 has a built in, wrist-based heart rate monitoring. Both of these watches have the ability to pair with your smartphone or computer to auto-sync your workout details to Garmin Connect. For those of you participating in our PaceBuilders Coaching programs or following one of our customized training plans, your workouts will automatically be synced via Garmin Connect to your Final Surge training plan accounts that we created for you. Your training plan and these running watches are synced so all you need to do is focus on your training runs.